The latest exhibition at Dulwich Picture Gallery has a lot to offer for those interested in the Slade’s history. A Crisis of Brilliance presents work by David Bomberg, Dora Carrington, Mark Gertler, Paul Nash, C.R.W. Nevinson and Stanley Spencer – a group of provocative artists who studied at the Slade from 1908-1912. The exhibition is based on a publication by David Boyd Haycock which charts the artists’ intersecting social circles to situate their developing artistic practices within their wider cultural context. 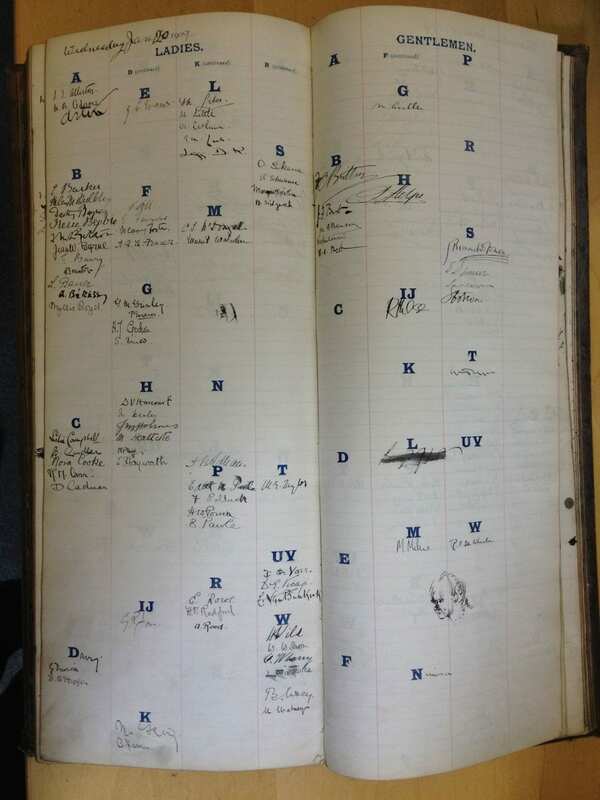 The school’s registers, or ‘singing-in books’ as they are known colloquially, have recorded the signatures of some of these well-known artists. Each register lists ladies on one side and gentlemen on the other. Over the years students have used the books to practice their sketching, as the back of this register shows. It would be quite a task to identify the artists at work (perhaps even some of the tutors pitched in?) but suggestions are welcome! The register covers the years 1907-1909 and on the 20th January 1909 we can spot the signatures of Mark Gertler, Rudolph Ihlee, Maxwell Gordon Lightfoot, Richard Nevinson, David Sassoon and Stanley Spencer. Dora Carrington and Paul Nash would not arrive at the Slade until the following year. The ‘signing-in’ ritual still exists. Current students are asked to log in each day as they enter the school. The books are still divided by gender as a reminder to students that they are part of a long heritage; the Slade was the first art school to admit women into the life room. Unfortunately most of the early registers are in need of repair. The Slade does not have an archive reading room or dedicated staff to facilitate research enquiries, so it is difficult to provide public access. As part of the Slade Archive Project, we hope to undertake conservation of these treasured record books so scholars, curators, alumni and family historians can delve into their pages.